Panmure Castle was probably built by Sir Peter Maule about 1224. A detailed account of the castle was written by Robert Maule early in the 17th century, at which time the place was in ruins, and in 1881 excavations were made to verify his description. The castle was built in the form of a rhomboid, 112' N-S x 119'. A tower had been built at each corner, projecting beyond the line of the courtyard walls - that at the NW was 37' square; at the NE, 24' square, and the other two measure 24' x 27'. The walls were 7' thick throughout. The castle seems to have been destroyed in 1306 by Andrew Moray to prevent its occupation by the English. The date of the restoration of the structure is unknown, but it is certain that its chapel was built before 1487 as it was dedicated to the Virgin Mary in that year. After the Battle of Flodden (1513), Sir Robert Maule erected a new hall on the N side of the castle and built a round tower at the NW angle. The building is supposed to have been habitable until the middle of the 17th century. 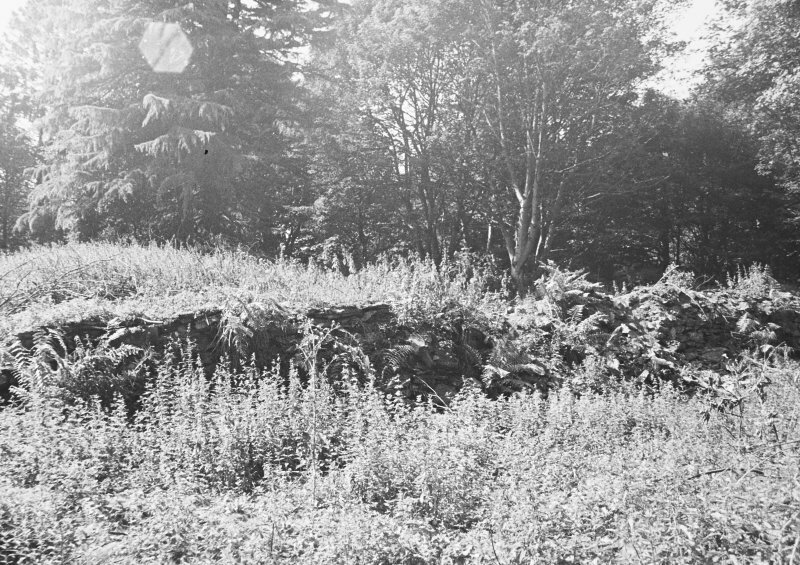 The remains of Panmure Castle are thickly overgrown with trees and shrubs, etc, and the existing walls are in a crumbling condition. It has been an extensive structure with a complex plan of buildings surrounding four sides of a large courtyard, and abutting the enceinte wall, which varies in height from 2.0m in the S to 0.8m in the N, while the E and N sides are generally 1.5m high. On the S, it is 0.6m high internally, but externally the face of the wall is covered with a sloping bank 2.5m in height. Beyond this is a terrace 2.5m wide. These outer walls are 1.5m - 2.0m thick. Scarcely any walls of the two southern towers remain. The foundations of the buildings vary in height from mere courses of walls to a height of 1.2m in some places in the N range. The entrances to most buildings are exposed. The well within the courtyard is still extant, covered by an iron grille. Outside, and also within the enceinte, are mounds, most of which appear to be simply the refuse of excavations carried out on the castle, and flattened out on top as ornamental terraces. About 60m to the N, however, are outer defences in the form of a massive earthen rampart beyond which is a large water-filled moat. The rampart is 16.0m broad and varies in height from 3.0m at the E to 5.0m at the W. Here a narrow terrace gives access to the castle. This rampart has been greatly effaced, and lies in a wood. The whole area of the castle is situated on a promontory with steep slopes all round, except on the N, where the moat has been added to complete the defences. Visited by OS (JLD) 30 May 1958. Scheduled as Panmure Castle and Moat. Information from Historic Scotland, scheduling document dated 6 December 2000.